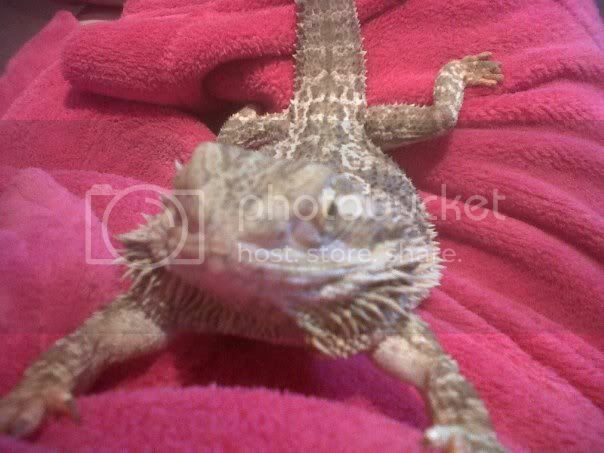 mybeardeddragons.co.uk • View topic - How did you fall in love with beardies? How did you fall in love with beardies? Post subject: Re: How did you fall in love with beardies? when my very grumpy chameleon died i went looking at my local reptile shop. The guy saw me looking at a panther chameleon which i held and it was friendly enough. I told him how grumpy cammy was and he asked me if i wanted something that would really enjoy being handled which i did. When he said a beardie i was thinking hmmm not sure as i had never thought to much about them. He got his out for me to hold and that was it i fell in love. It was the sweetest thing and i was amazed it wasn't puffing up and hissing like cammy used to lol. The next week i went back to buy kiah. So happy the guy pushed me in that direction. When i was younger my freind took his snake into school so i really wanted a snake i told my mum and she said NO! i just had to ask for christmas but i didn't get one. eventually my mum decided to take me to a reptile shop and i was so interested in the snake that i wouldn't look at anything else but soon they got me to look and i loved them! So after a few years of asking for a snake i changed my mind and i wanted a bearded dragon. and i got one for christmas!!! Last April a friend died of cancer leaving a husband and a 12 year old son. Spike was bought for the son by Silvia (the mum) and after her death he just stopped bothering with him. I think Spike reminded him too much of his Mum. Anyway we went out one day with the husband and the son and it was mentioned that they were going to get rid of Spike - to a sanctary if no one wanted him. We picked him up the next day and havent looked back since - now i would love a baby (a red one they are gorgeous). Spike is such a funny character so grumpy one minute and loving the next. Well my story starts with my mom wanting fish. she was going to the garden centre to get some fish for her tank so i decided to go with her. when we arrived at the garden centre my mother told me there is a reptile section so i went to look at the snakes and the spiders. As i walked in i completely blanked out the snakes and spiders because i saw the beardies. I didnt know you could have them as pets. anyway all the way back home i was nagging my mom for one. i reasearched how to look after them for like three weeks then i got spyro for christmas. My son said out of the blue one day that he wanted a lizard, I laughed it off (as i bunched snakes, spiders and lizards together - horrible reptile things). But my sons requests got more frequent. I was in the pet shop buying dog food and my son called me over to look at something - the shop lady was holding this cute looking lizard which she told us was a bearded dragon (not to my expectation at all). she held him whilst we all had a stroke. i was suprised at how sociable it was and not jumpy or timid. It had completely changed my views of lizards and I started wanting this bearded dragon as well. The kids and I tried to convince my husband but it was a straight no, after about a week of asking we gave up and realised we were not having one. Then about six weeks later my husband and I had to go to the pet shop to get gravel for my sons new aquirium (as he won a gold fish at the fair). I showed my husband the bearded dragon, the same one that id seen six weeks ago. My husband got chatting to the shop lady (my husband loves to talk and talk lol) The lady got the bearded dragon out and my husband and I had a turn holding him. My hsuband then turned around and asked the lady what was the best deal she could do for the whole set - the tank, heater, usb light etc. She knocked quite a lot off so my husband said as it was a very fair price we would buy the beardie then. I was so shocked. We took the aquirium home first and my husband quickly put it up. We then went to get the kids from school (did not tell them hehe) and went to pet shop under the pretend reason of buyimng something for the fish tank. The shop lady had put a sold sign on the beardies tank. My husband said to my son would you like that bearded dragon. my son said we cant because it's been sold. my husband teased our son him for a bit longer and finally turned around and said 'I no someone has bought it cos it was me that bought it' It was so funny as my son did not believe us at all and thought we were having him on. Even when the lady was puting the dragon in the travelling box my son was still looking at us trying to work out if we were being serious. When it finally sunk in he was so excited he was in tears and kept hugging my husband and I over and over again. That's a lovely story! I never thought I'd fall in love with a reptile either, but beardies are such lovely creatures! My son had one in his classroom that had babies. I saw the pics of when they were just hatched and fell in love! my partners uncle had brought one for his son as a b day/ xmas pressie (i agree with the slogan a beardie is for life not just for xmas) n e way his uncle mentioned that his son was not looking after her and was bored of her so i spoke to my partners mum who said no more pets as our staffie is a pain but i brought a book as was planning to get one when i move into my own place then my partner found out and as his mum generally spoils him said yea and we got her that day had her 5 days now and the staffie still getting used to her but i swear she winds her up she gets very active when the dog is in the room. But i definatly do love beardies and when i move out am hoping to breed them and just know that all the info i need will be on here!!!!! Breeding is good fun, but very very expensive. You seem to be a responsible pet owner, so before you get too into thinking of the patter of dozens of pairs of little feed, consider the amount of baby beardies there are in rescue centres as breeders just can't give them away. You can easily pick up a baby beardie for £10 - paying so little for a pet like this means people buy them on a whim, and don't realise how much they cost to feed, and what the equipment costs. So, think about it very carefully, and read the info on the breeding part of the forum. I heard of a beardie that needed rescuing and went to look at him... he's lazy, grumpy and has a real personality ( although a grumpy one ) I immediately thought wow he's nearly as miserable and grumpy as me....so I got him then and there!